Is the service running on the VM? Is the guest OS firewall blocking the service? Is access blocked by a firewall or proxy server? Make sure you’ve correctly configured published services for the VM. For more information about configuring published services on Skytap VMs, see Accessing VMs with published services. Verify that the service you’re trying to connect to (RDP, Web server, SSH, etc.) is running on the guest OS of the VM. A guest OS typically has a software-based firewall that blocks most connections to a VM by default. 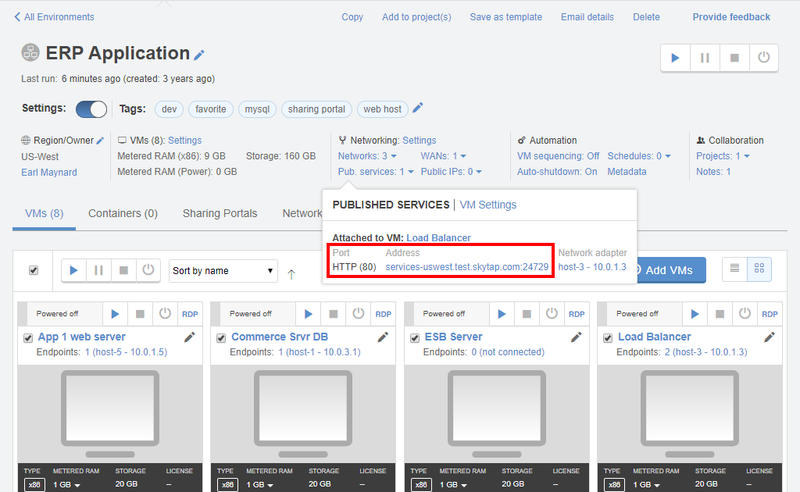 Even if you add a published service to a VM, you may not be able to connect to the VM unless you change the firewall rules to permit access to the IP address and port assigned to the VM. For information about configuring firewall rules for your guest OS, see the guest OS documentation. For instructions about editing Windows Firewall Rules, see Configuring Firewall Rules. For general information about Windows Firewall Rules, see Understanding Firewall Rules. From the Environment Details page, under Settings, click Pub. services. The port for which you need to create a firewall rule is displayed under Port in the Published Services dialog. In the example below, port 25190 on services-uswest.skytap.com redirects to port 80 on the VM. Make sure that the guest OS has a firewall rule that permits traffic on port 80. Many networks commonly use firewalls or proxy servers to block the higher port ranges that Skytap uses for published services. Check with your network administrator to determine whether those port ranges are blocked on your corporate network. In the example above, your local network must allow traffic to services-uswest.skytap.com on port 25190. For more information, see What IP addresses and port ranges does Skytap use?